I’m not a horse person. My aunt, however, is. She’s been kind enough to let me play some shaping games with her horses and open-minded enough to begin to shift towards a more reward-based frame of mind. One day she told me about a friend of hers, Ann, who couldn’t load her horse, and asked if it was possible to do with a clicker. My humble and articulate answer was along the lines of “well duh”. She told Ann and before I knew it there I was, having to own up to what I’d said. How exciting! The plan was to teach her young horse Amour to go to a cone, and then place that cone further and further into the trailer. As weird as it seemed to a horse person it seemed perfectly straightforward to me. It worked beautifully, and Amour never seized to impress us with his wits and bravery! When I hear the click, good stuff happens. When I don’t hear the click, nothing happens. I make the click happen by doing things. Amour has a choice: stand still and get nothing or go to the cone and get the good stuff. Conventional horse training based on negative reinforcement (“pressure/release”) gives the horse a different kind of choice: Stand still and feel pressure or move and experience relief. For a number of reasons that’s not my first-hand choice, though I’ll admit it usually works OK in terms of getting a calm horse to do what we want (as evident by seemingly the vast majority of the horse world using it). But it works badly, if at all when we need them to do a Scary Thing. Here’s the problem: If doing the Scary Thing is to provide a sense of relief, the pressure they get away from must be even more unpleasant. Are you scared of spiders? Imagine going “sigh, what a relief to have this tarantula on my face”. If you had a choice between having a tarantula on your face and something else, how bad would that other thing have to be for you to choose the tarantula? Not only is this ethically questionable, there is also a risk of accidentally flipping it around and have it work against you. If the horse is successful at planting his feet or lunging to the side to avoid entering the trailer, he may think “whew, what a relief that she’s just pulling on the halter, I can do this all day as long as I don’t have to go into the trailer”. He’d then be negatively reinforced for avoiding the trailer. Whoops! This is one of the reasons we use a target instead: it’s a tool for giving direction without pressure. Ann and Amour continued to play the cone game. A few times a week for around 5 minutes or so, they played it indoors, outside, Amour got to go around corners to find it, walk over different types of flooring, through doorways, find it at different heights. He adored this game and even did some Scary Things to win it, like walking on a wildly suspicious piece of the tarp (when Ann and I became distracted and started chatting he even grabbed it with his mouth and waved it around to get our attention, – “Hey! Why are you not clicking? I’m doing a thing, look at me!” Thanks, Amour for reminding us to be more focused!). Eventually, we started setting up scenarios that resembled that of walking into a trailer, like the one in the video below. Side note: Next time I got there, Ann had taken the awesome initiative to teach a verbal back up cue instead of using pressure on the halter. It was so fun and easy with the clicker, so why not? What a team! By now Amour clearly knows how to play this game and is OK with the “leveling up” we’ve been doing. It’s time to face the boss. In our first session with the trailer, Amour was OK putting his front hoofs on the ramp, but that was it. The back ones were firmly rooted into the ground, like two 100-year old oaks. This was as far as Ann had gotten without me, before clicker training, so getting him un-stuck would be a big deal. She had the patience of an angel and had been standing there for over an hour, trying to lure him on board with carrots. As much as I admire that, I certainly do not have that kind of patience. I expect progress. I tried moving the cone further up the ramp to see if he would follow it, and he pawed at the ramp and snorted in frustration. No wonder, I had just made the game un-winnable for him! Not cool! This is what happens if we are in too big a hurry to raise the criteria, and this is often where we get frustrated. People call their animals stubborn, stupid, silly and give up on the training method. Luckily the issue is not the personality of the animal, or flaws of reward-based training. The problem is simply a gap between the ability of the learner and the expectations of the teacher. And as opposed to the other commonly suggested diagnosis, this one is easy to fix. We can’t instantly change the ability of the learner, but we can change our expectations. Simply adjust the criteria! Fill that gap with more training steps! We gave Amour a bunch of easy wins on the ground away from the trailer to brighten his mood and sandwiched in a few repetitions of the ramp. He relaxed, and we were able to end the session on a good note. Want access to the whole kit & caboodle of Animal Training Academy resources… CLICK HERE to see what’s on offer via your very own Animal Training Academy membership. Wow! Not only does he put his back hoofs on the ramp. He goes above and beyond and goes almost all the way into the trailer. He even straightens himself up when he notices he’s coming on at an angle! The effort to keep his feet on the ground had turned into an effort to get his feet off the ground! He was far more relaxed than the last session and was curious about the inside of the trailer. You may notice he is moving back and forth. He didn’t back away from the cone off cue before, why does he do it now? The thing is, he has a different kind of choice now that there is a Scary Thing involved: He can now choose between positive reinforcement (food, inside the trailer) or negative reinforcement (the relief of accessing the security outside). The learner decides what’s reinforcing. At any given time, they will do what’s most reinforcing to them. We want to reinforce them in the best way possible, and letting them choose their reinforcer is an easy way to do it. And though it may seem counterintuitive, we’ve got the Premack principle working in our favor: Likely behavior (backing out) reinforces unlikely behavior (going in). Some convenient side effects are that he gets to practice backing out calmly and sets himself up for a new repetition as he does it, but most importantly it keeps him calm and happy. If we try to keep him inside with pressure or close behind him before he’s ready, we’d be punishing the behavior of going in and he’d be less likely to do it in the future. Not exactly what we’re going for here… So we click for forwards motion, allow backward motion, and make sure to avoid putting pressure on the halter. Of course, we want the clicks to outnumber the back-outs, otherwise, we’d be teaching the wrong thing and again get a frustrated learner. The fact that he wants to back out is also valuable information and should not be taken lightly. It tells us how he feels about the trailer: As long as the trailer is a Scary Thing, avoiding it will be reinforcing. However, as he learns to associate the trailer with Good Stuff, it will stop being a Scary Thing and avoiding it will no longer be reinforcing. Pavlov is always on your shoulder. When he stops backing out off cue, we know he’s comfortable inside. Being stuck in a small space. Staying balanced when the trailer is in motion. So no, we are not done. We rely on the trailer being not just tolerable but reinforcing, to get him to go inside. If we rush things, we risk having to start over with a much more suspicious horse. So we played some more trailer games. Ann had certainly gotten a taste for clicker training by now, and they both really enjoy the sessions. So why not teach him to go in on his own? Yeah… the trailer isn’t a Scary Thing anymore. He’s not worried about it. But we did have a couple of sessions where he was worried for other reasons. One time he had been sedated in the morning and I came by in the afternoon. Another time there was a lot of traffic, and he was restless and over-stimulated, so he was very busy looking at the tractors and machines driving by. And as spring came along suddenly there was delicious grass everywhere, which was much more appealing than the treats we used. These circumstances are far from ideal for learning. But as much as we want to set up our learner for success, we also want this behavior to be bombproof. It needs to work under less-than-ideal circumstances. Raising one criterion means we need to temporarily relax other criteria. Those days he didn’t always go inside on his own, either because he wanted to keep an eye on the traffic, or because he’d rather eat grass. Ann complained a little about having to lead him into the trailer, and then interrupted herself saying “wow, I got so spoiled!” It’s so easy to fall into the perfectionist trap when you realize you can train anything, (personally I have severe hubris and do it all the time) but we need to strive for progress, not perfection. If the environment is overwhelming, it’s up to us to make the task easier that day. That’s not regression, it’s proofing. Besides, he always walked in and never got stuck to the ground again, so his new “worst” was a lot better than his old “best”. We also worked on independence and duration by letting him stand inside alone and eat hay. Meanwhile Ann and I would hang out outside the trailer. Because we couldn’t see him it was difficult to guess what he was experiencing. So every now and again we’d take him out, and ask if he wanted to go back in. Had he hesitated, that’d be a sign to us that we’re asking a bit much. Had he not wanted to go in at all, that’d be a sign we are getting way ahead of ourselves. We seemed to be going on perfectly though since he always wanted to go straight back in. Good, that means he still finds it reinforcing! Eventually, it was time for his first ride. As you can see in the video below, he was not comfortable at all. The ride was short and slow, but the roads were bumpy (as they are in the Swedish countryside). He struggles to stay balanced, snorts, the whites of his eyes are showing, there is tense, twitchy movement and very active ears, and at first, he doesn’t eat. After about a minute his movements slow down ever so slightly and he takes a bite. I believe if we had been on a straight, smooth road and been going for a longer ride, he would have eventually relaxed more. But that’s for another time. When we got back home we did our little test that I described above: Will he go back in? And despite the very weird and somewhat scary thing that had just happened, he did! What a hero! That, to me, is a sign that the foundation training is robust, and that we have achieved trust. He’s had enough positive experiences with the trailer so that even if something strange or scary happens, the average experience is still a good one. Susan Friedman describes trust like a bank account: many little investments in the form of pleasant experiences, and you’ll survive some economic blows in the form of aversive experiences (CLICK HERE to listen to an ATA podcast episode with Dr. Susan Friedman). We’d built a good buffer throughout the training, so the struggle to stay balanced wasn’t enough to deter him from going back into the trailer. After this, we did only one more session, where we drove him to a different place, went for a walk, loaded him again and then went home. Still, no hesitation to go inside. I trust Ann and Amour to work out the rest on their own. This was a wonderful learning experience for all three of us. Amour learned to go into a trailer, a crucial life skill for a horse. Ann learned about reward-based horse training, and she is hooked. And I learned so much from them both! If I were to do this again, there are some things I’d change based on the things I’ve learned (I’d try to split the steps between standing in the trailer and going for a ride more, among other things). And through this whole experience, the ATA community answered my questions and cheered me on, so thank you guys for being awesome. Like what you see here? And want more amazing resources from Animal Training Academy. CLICK HERE to see what’s on offer for you within the ATA Membership. 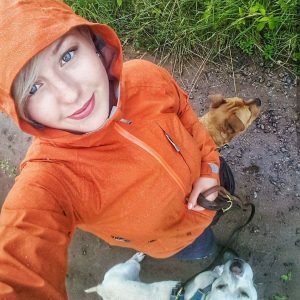 Josefin is a Swedish animal lover and dog trainer. She is generally curious about how things work, and that curiosity has always been directed to animals. In her efforts to learn to understand her own two dogs, she became a professional trainer. Other than training dogs, she administrates a couple of FB-groups for reward based training, runs an R+ book club and shares tips and videos on her own social media, always with the goal to inspire fun in peoples lives and empower owners to feel confident using reward based methods. In the last year, she’s tried her hand at training some other animals as well, including bunnies, horses, and chicken. Josefin can be found on Instagram, Facebook, and youtube as Djurpedagogen. Wow!!! What a fabulous article! This is not really new to me but the way you have worded it and explained the process is brilliant!! I have always taught people to concentrate more on allowing and then teaching them to back off. If it’s easy to get off, getting on is way less scary. Thank you for explaining the ‘why’ of that!! Super, super, super article! Thank you so much, Josefin, for taking the time to video the training and write this all out. And thank you, Ryan, for having this blog section. This is so valuable!